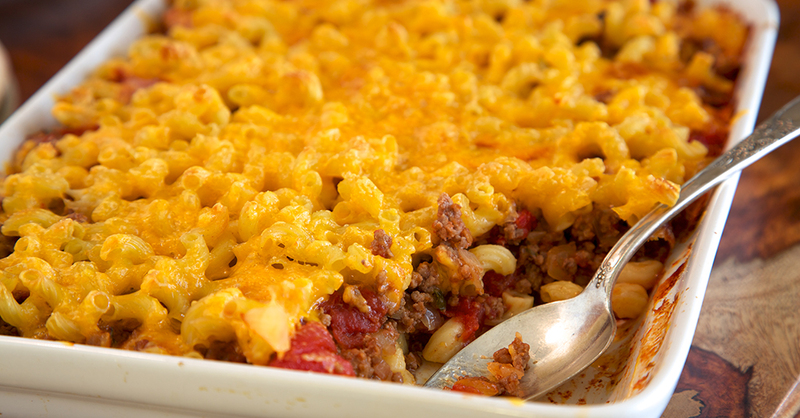 Dish up a serving of this hearty mac and cheese-burger casserole to put a smile on the faces of your entire family. By combining two traditional feel-good favorites, this casserole makes the perfect weeknight meal. A layer of crumbled hamburger mixes with savory tomatoes, onions and green peppers to spice things up, while cheesy macaroni adds the perfect top note to this delectable dish. Regardless of what you serve this with, this dish will hit the spot and your fam will be begging you to make it again before you know it! Preheat oven to 375º F. Brown ground beef on stovetop, stirring in onions, green pepper and garlic and cooking until tender. Drain excess grease from beef mixture. Add Dijon mustard, dill pickles (if using), and tomato sauce, heating mixture to a slow boil. Boil elbow macaroni in a large pot of salted water for 8-10 minutes until tender. Drain and rinse with hot water. Line the bottom of a 9x13-inch greased casserole dish with 1/3 of the pasta. Spread beef mixture over the top, allowing sauce to sink into pasta. Combine remaining macaroni with the cheddar cheese. Top casserole with macaroni and cheese. Place baking dish in oven and cook for 20-25 minutes or until heated through. Cover top with foil during the last 10-15 minutes to prevent browning.